the Midlands and the far Southwest. 1500s, when it was used for the production of alkaloids. It has been recognised as a naturalised escape since the 1770s. 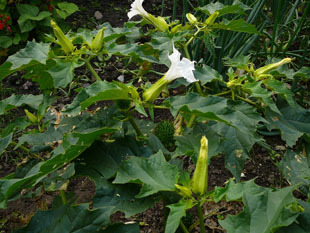 sown or from bird seed. germinating when ground is disturbed. 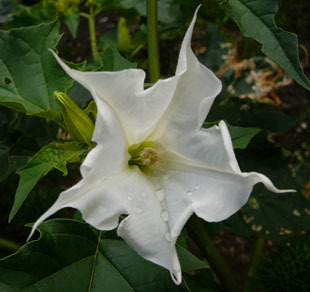 Flowers are white, up to 8cm across, solitary and showy. The calyx is 4cm long, 5-angled and pale green. 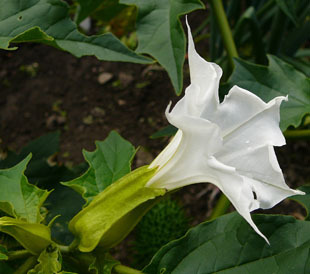 The flower is funnel-shaped with spreading, toothed lobes. Fruits are in the junction of the branches, spiny and up to 7cm. 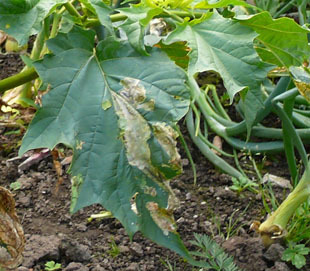 Leaves are dark green, up to 20cm and jaggedly toothed. 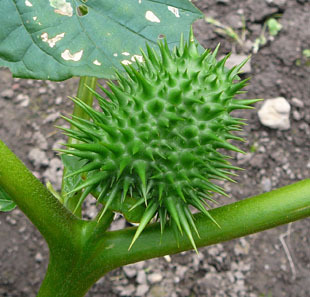 Thorn-apple has an unpleasant smell.